Taking over the top job, whether it's the CEO of a company or the manager of a department, is never easy. When done the right way, it results in inspired leadership; when done the wrong way, it can lead to disaster. To be effective, the people in charge must give their team a reason to believe in their talents and their ability to get people to work together. Great leadership requires decisiveness, authority, conviction, compassion, and, most important, the ability to set the right example. It would seem easy, but it takes a lifetime of trying to put it into practice. 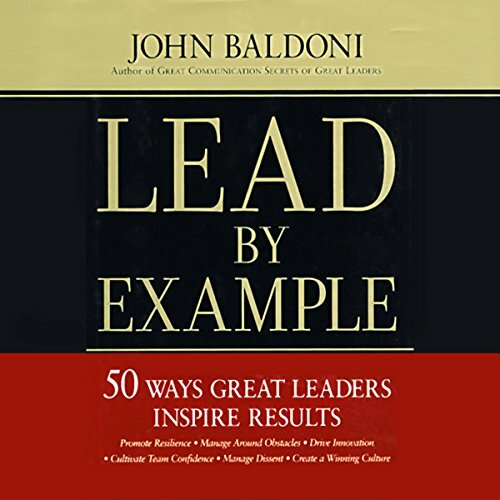 In Lead by Example, recognized leadership guru John Baldoni reveals the traits and abilities leaders need to know to inspire others to follow them. Readers will learn how to: listen for ideas manage around obstacles defuse tension check their egos stand up for what they believe in manage crises develop team confidence recruit good people deliver bad news handle defeat engage their enemies. Filled with examples of visionary leaders who have overcome their shortcomings and achieved greatness, Lead by Example will show readers how to build trust, drive results, and win the respect of the people they lead. ©2008 John Baldoni (P)2009 Audible, Inc.